I’ve simulated the bitcoin price for the whole 2018. You won’t believe the result! Disclaimer: This is just for fun, my opinion and not investment advice. Do your due diligence, don’t do stupid things and don’t hold more USD than you can afford to lose. Anyway, in the particular case of Bitcoin, I believe it is sound money, while fiat money is not. So if you think sound and uncensorable money is important to enough people, that could be a reason for the future returns being similar to the past ones, until a majority of the population realizes Bitcoin is better money. Now that you’re here after that clickbaity headline, let’s play a little with some numbers. Don’t worry, this’ll be only a ~5 minute adventure. 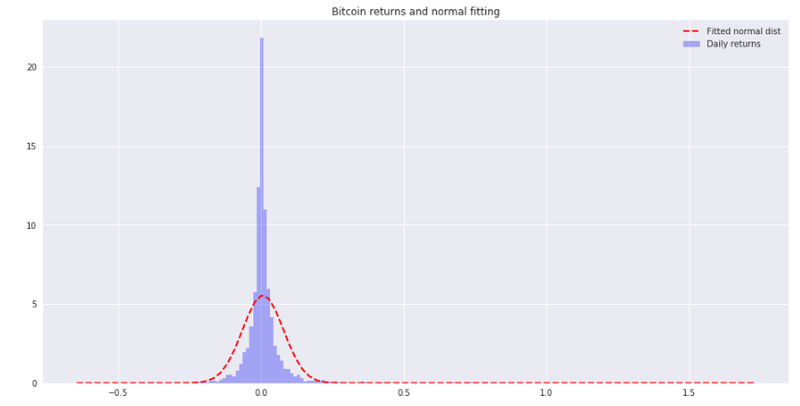 Here I’m doing a simple Monte Carlo simulation on the daily returns of the USD bitcoin price to try to know what will be its most likely price by the end of 2018. You can see the whole code used to create this in my GitHub. In an ideal world, the daily returns of financial assets would come from a normal distribution, but the reality far from that, and the actual daily returns have fatter tails. What does this mean? It means that extreme events have a higher probability of happening than a normal distribution would predict, and the distributions are not alike, as you can see below. Here you can’t tell the difference between the tails but believe me, the ones from the returns distribution are fatter. Ok, but what is a Monte Carlo simulation? According to Wikipedia, Monte Carlo methods (or Monte Carlo experiments) are a broad class of computational algorithms that rely on repeated random sampling to obtain numerical results. 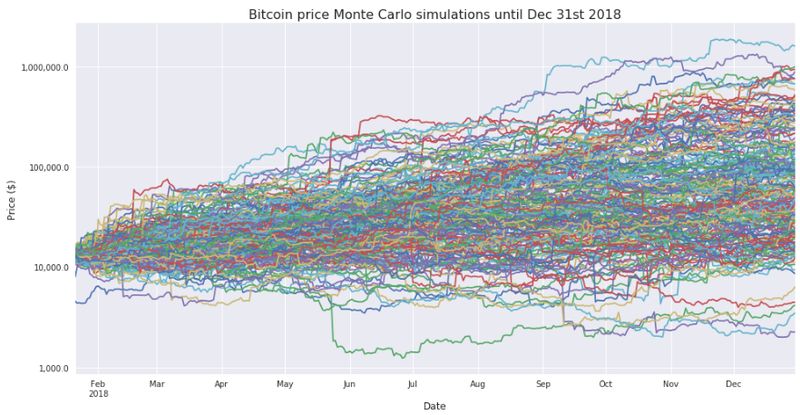 Basically, in a Monte Carlo simulation in finance we assume that the future behavior of the price of an asset will be similar to its past behavior, and we generate a lot of random versions of that future, called random walks, similar to the past. That’s done taking random samples from the past and stacking them together to build each one of those random walks. 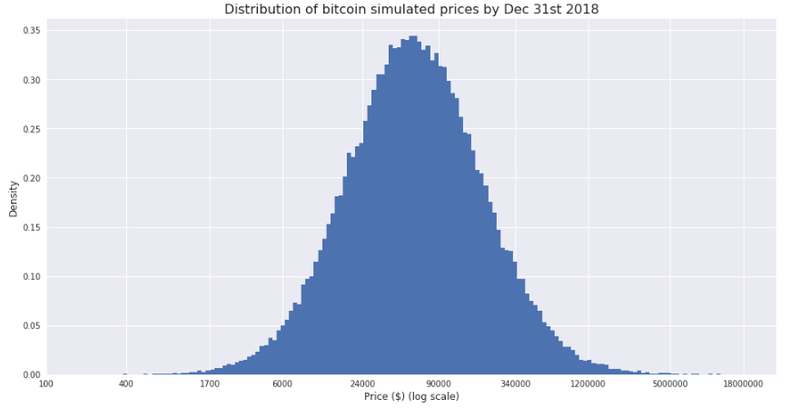 To build each of the random walks in our simulation, we’ll take random samples from the daily returns from 2010 to today, add one to each one of the samples and and multiply them cumulatively until Dec 31, 2018. 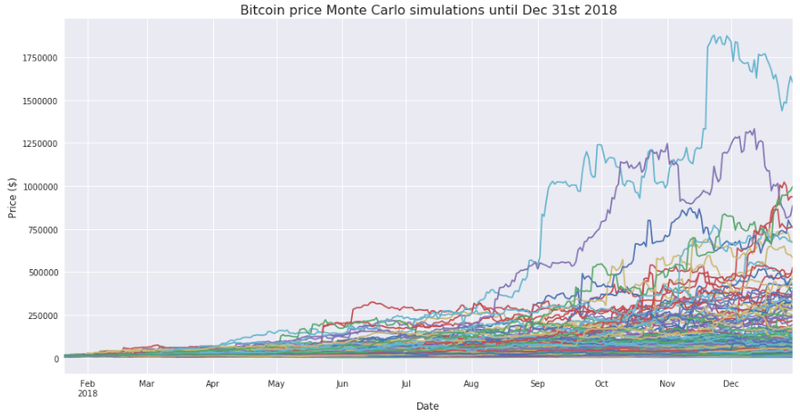 Then we multiply the current price of bitcoin times the values of the random walk to get the simulated future prices. 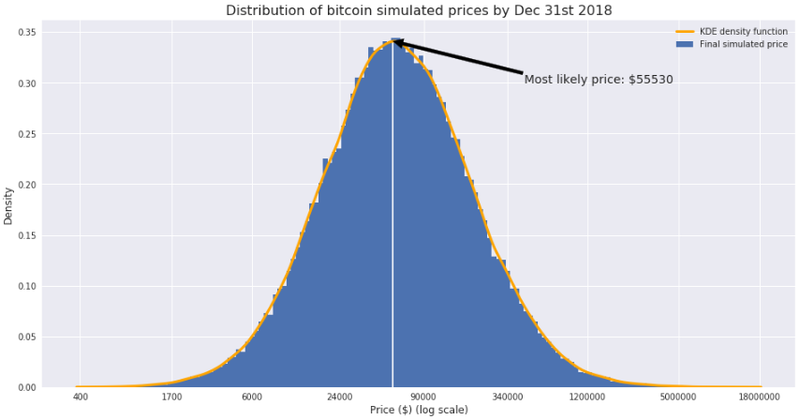 This will be done a lot of times (100,000 in this case) and at the end of the year we will see the distribution of final price for each random walk. As you see, the estimations for the most likely price are similar, and both above $50K. It’s important to note that this estimation doesn’t have to be taken to the letter and it’s better used as a way to find confidence intervals on where the future distribution where be. 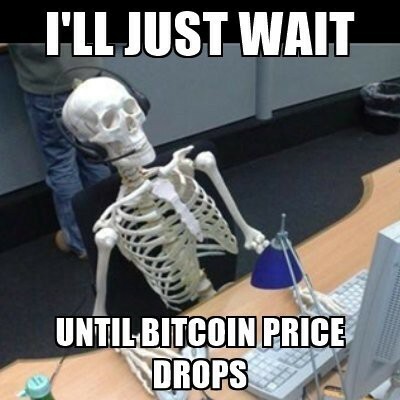 In this case an 80% confidence interval for the price of bitcoin would be between $13,200 and $271,277. 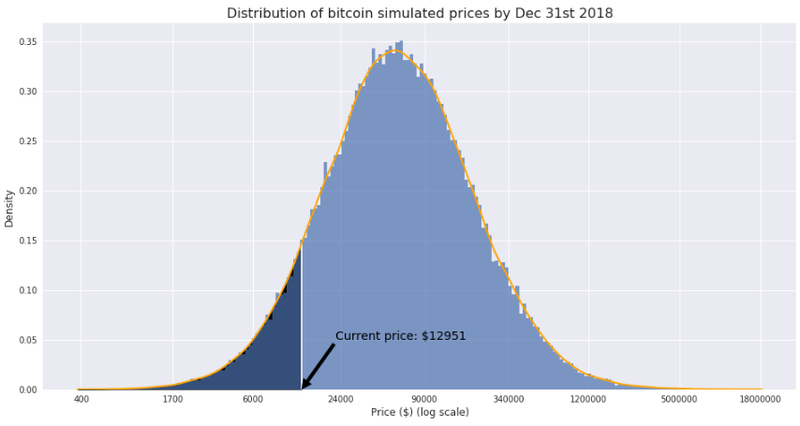 Another way to look at this is that the chance that the price at the end of the year will be below 13,200 is the same as that of it being above $271,277 (if the price moves in the future similarly to how it did the past). 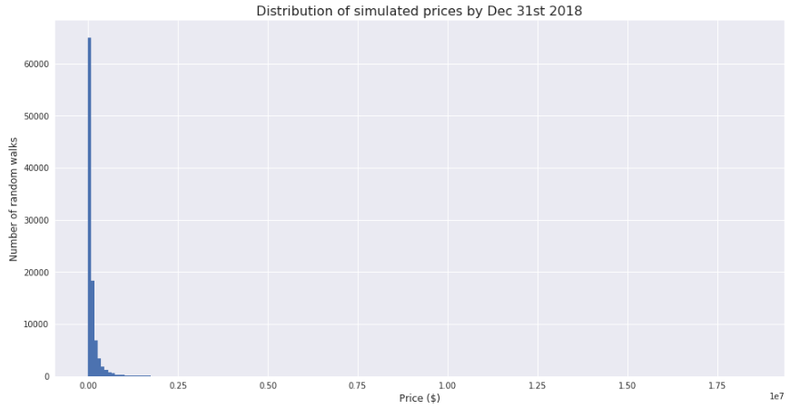 Now that we have the KDE density function, we could, for example, compute the probability that the price by the end of the year will be below a certain level. And what’s that probability? 9.84%. ‘I never thought that probability was so low!’, his last words were. Yeah, I know. Nothing can keep going up forever, and the fact that it did in the past doesn’t mean it’ll do in the future. Below there’s a chart of another thing that has also gone up a lot in the past. The monetary base is the most liquid part of USA money supply. It includes notes, coinage and bank deposits. And you, do you believe the USA can keep printing money out of thin air forever? See the Jupyter Notebook that created this in my GitHub account. 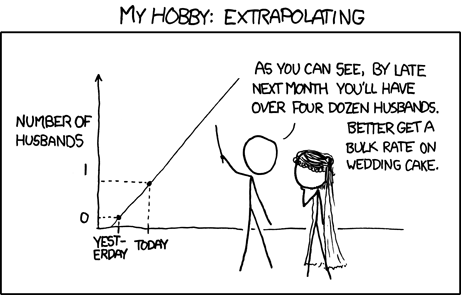 I like ML, data visualizations and freedom. Data Scientist. On Twitter: @xoelipedes.